where they tempt random people to kill a mouse for the munificent sum of 10 euro. I am glad to say a quarter resisted under all experimental conditions. "... a number of subjects were not tempted to engage in trading, i.e., apparently markets did not erode values of all subjects. 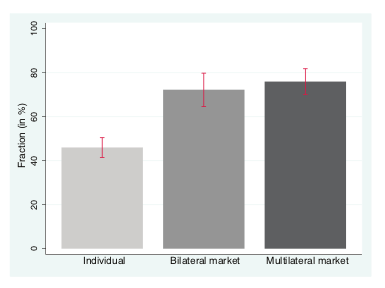 22.2 percent of all traders in the bilateral market never traded, while in the multilateral market, 24.1 percent never traded. The fraction of subjects who refuse to trade money for life of a mouse at all was even higher in the individual price-list condition. 27.1 percent of subjects were unwilling to kill their mouse even for the maximum offered monetary amount of 50 euros." "Apparently, markets did not erode values of all subjects. We speculate that subjects who refused to exchange money for mouse life at all may have followed a rule-based, e.g., Kantian, ethic: "€œ... everything has either price or dignity. Whatever has price can be replaced by something else which is equivalent; whatever, on the other hand, is above all price, and therefore admits of no equivalent, has a dignity." But the whole story is grimmer. As I have long suspected, more people killed mice in 2) and 3), as soon as a market in micelives was set up. And the price dropped, the longer they traded. It gets easier the longer you do it. 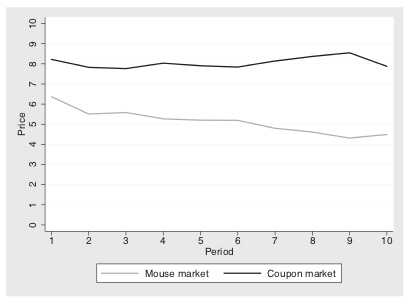 The graph below exhibits the decrease valuation placed on a mouselife as a function of time that trading continues, as compared with the market in merchandise coupons, which does not exhibit a decrease. The traders rapidly lost compunction, care or pity for the mice as time went on. So, how many crushed by rubble did that cheaper T-shirt cost ? Or, in the case of fossil carbon trade, how much is a drowned Asian worth ? Remember, sinning becomes easier as you steep in evil. You will murder the tenth quicker than the first, and not care at all when you kill the hundredth.